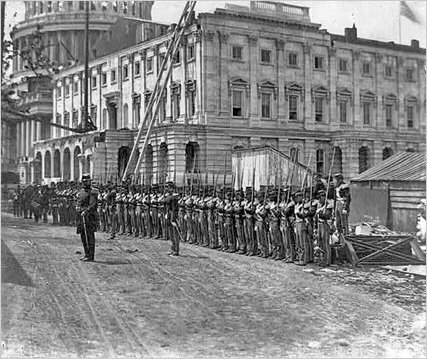 “Union soldiers at attention in front of the Capitol,” Histories of the National Mall, accessed April 22, 2019, http://mallhistory.org/items/show/351. Union soldiers monopolized the spaces of the National Mall during the Civil War. At the outset of the war the US Capitol was a work-in-progress. Despite the war Congress pushed for its completion as a symbol that the ideal of a United States would transcend the disunion of the war years. However, early in the war, construction halted as Union troops occupied the building. With their eviction in 1862, construction resumed. Statues and forts around the city raised gun salutes for the installation of the statue on top of the dome in 1863.